Jain (pictured above, with McFarland, Jason Bell, and Ja Rule in 2016) is probably a name that was unfamiliar to most viewers who tuned in to one of the newly released documentaries about Fyre Festival: Netflix's Fyre: The Greatest Party That Never Happened and Hulu's Fyre Fraud. 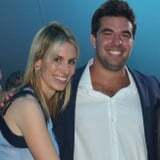 A marketing executive and the wife of a high-profile hedge fund manager, Jain became involved with McFarland and company just as the buzz around Fyre was taking shape. According to a Vanity Fair article that dissected the whole fiasco, Jain contributed to a huge loan for Fyre alongside a group of other investors. According to The Guardian, Jain was just one of many who were defrauded by McFarland - although the sheer amount of her investment put her in a league of her own. Oleg Itkin, a Manhattan investor, sued over a $700,000 loan he had made to McFarland after seeing massively inflated and falsified projections, while Ezra Birnbaum and his company, EHL Holdings, took legal action over their $3 million loan. The outcome of Jain's suit is not currently known. Correction: An earlier version of this article stated that Jain made a a $4 million investment in Fyre, but has since been updated to reflect she made a loan, instead.